Asian meets Craftsman in this two story hillside home perched high above the city lights. Full kitchen with every amenity including a professional stove, oven, and gas grill on the deck. We even have cook books! Lounge in the library, relax in the great room as the morning fog drifts across the Rogue Valley, or share a great bottle of local wine while you sink into the leather sofas in front of the grand river rock fireplace. In the cool evening after a play you can soak in the hot tub on our enormous deck and watch for shooting stars. The milky way is very bright in our clear, cool air at 2500 ft. During the winter we even get the occasional snowfall! With private rooms for 4 couples plus 2 futons in the media room there's plenty of room. The giant granite dining table seats twelve with ease and there's space to spare if you need to escape with a good book. Of course, we also have hi speed wifi throughout the house. Miles of hiking and biking trails are just next door at Oredson Todd Woods. During the summer months the Water Park at Emmigrant Lake is just the place to cool off. We've been coming to the Oregon Shakespeare Festival since 1984 and long ago fell in love with Ashland and the Rogue Valley. Since we cannot be here full time we thought we should share our lovely home with you! Back in 1983 my high school english teacher invited some alumni students on a camping trip to Ashland to see a few plays. The next year I brought my girl friend with me. She loved Ashland and theater... so I married her! We've been coming here ever since and now own a home so we can enjoy it in comfort. The peace and quite of our location, while still being right at the edge of town, made this an obvious choice for us. We can be downtown in just a few minutes but can escape back to the deck for the sunset and a glass of wine. Perfect. Great room with sofas and chairs, a game table, and a high table for two as well. Cuisinart DCS-1200 and grinder. We do not supply coffee beens as we think it should only be fresh. We clear out the fridge and perishables between guests. Every item you should need. Pro Cooktop and Oven. Plumbed Gas Grill on the Deck. There is also a Kitchen table that seats 6. Giant LCD/LED TV with 5:1 surround sound, Blue-Ray DVD, and extra connection so you can bring your own Roku or Game box. Library room has an ever-growing collection of books for rainy days. A number of old-fashioned board games are available in the library. Deck table and chairs for outdoor dining near grill. Brand new 6 place hot tub sunk into the deck for star gazing and soaking after a play, long hike, or bike ride. Even with smoke permeating the Ashland valley, our stay at Tolman House was a wondrous experience. We opened the front door to a majestic vista of the mountains north of town, and a near river of colored stones meandering through the foyer. There were six of us staying for four nights, and everyone enjoyed the opportunities for privacy and togetherness which the space enhances so effortlessly. We were a few minutes' drive from the Shakespeare festival and downtown restaurants, and also enjoyed a walk around the immediate residential area. Amenities of the house include a large hot tub, very good sound system, and den areas both upstairs and down, capable of accommodating all manner of entertainment tastes, from the quiet and cerebral to big-screen football watching. The hosts have made a concerted effort to equip the house with everything a guest could need, and their thoughtfulness translated into a marvelous vacation for us and our family. 5+ STARS - Beautiful, fully equipped, immaculate home! This was our fifth time staying at this beautiful home. 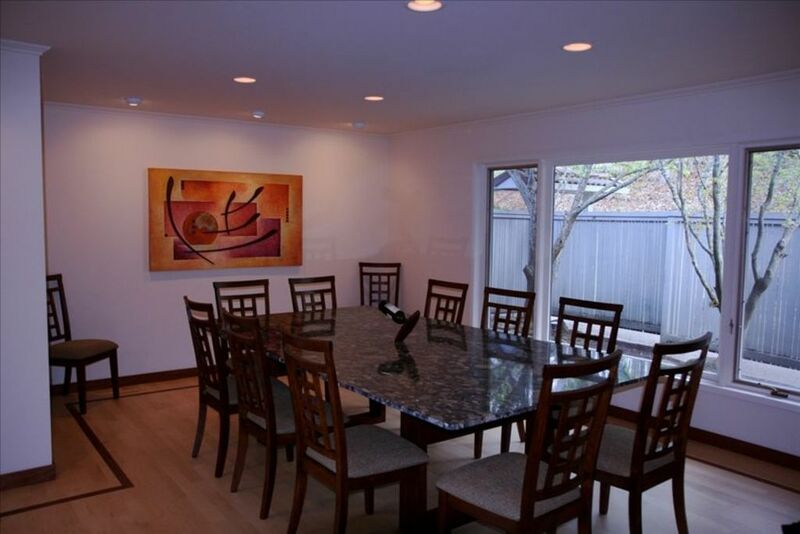 The area around this home sitting on a gentle hill is full of Rogue Valley nature and beauty. We like staying here because it is just far away enough from Ashland's Main Street to feel peaceful but close enough to go to the Festival plays and of course enjoy dinner out. The Tolman Home is fully equipped. You will need nothing but your toothbrush. We love shopping at the Market of Choice and cooking our own meals. We make good use of the oversized living room by discussing the plays we attend. Easily sleeps our two families with space to be alone when you want. Perfect spot to visit Ashland and drive to Crater Lake...beautiful! Spacious, beautifully furnished home with wonderful views and a friendly visiting deer. We immensely enjoyed our fourth year(!) of staying at Tolman House. The consensus is always the same: it is a wonderful retreat where we (10 women) can truly relax and feel comfortable, a home where everyone can get together or have their own space. The group appreciates all of the thought Neil has put into making this a special place to visit. We traveled to Ashland to celebrate my husband's 75th birthday and our granddaughter's 5th birthday along with family members from the east and west coasts. Tolman House was the perfect venue for sharing delightful meals, recounting adventures of a lifetime, creating memories we all - young and old - will treasure and simply being present to the beauty of nature. This is the most lovely and well-appointed vacation home one could possibly imagine. The home is warm and welcoming - we never for a moment felt as though we were strangers. The owners are most gracious and accommodating. We hope to return to this magical place again in the future and recommend it highly to others. Available mid February through early November. 4 day minimum stay.